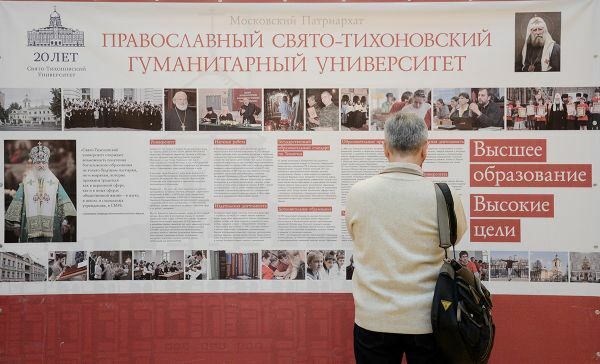 The 20th anniversary of St. Tikhon’s Orthodox Humanitarian University was celebrated at the Hall of Church Councils of the Cathedral of Christ the Saviour in the evening of 18 November 2012. Rector of the University, archpriest Vladimir Vorobiev, greeted the Primate of the Russian Orthodox Church and all those present. He announced that the Academic Board made His Holiness Patriarch Kirill of Moscow and All Russia doctor of the theology honoris causa and gave him the diploma. His Holiness addressed the participants with his primatial word and donated a Kazan icon of the Mother of God with inscription to the University and gave his blessing to distributing small icon of the Saviour to the students. Church awards were presented some professors, teachers and benefactors of the University with the blessing of His Holiness.